As you can tell by the light in this photo the days are getting shorter. It was 80 degrees, windy, and humid today. A combo I hate, but we can call that fall in NYC for now. 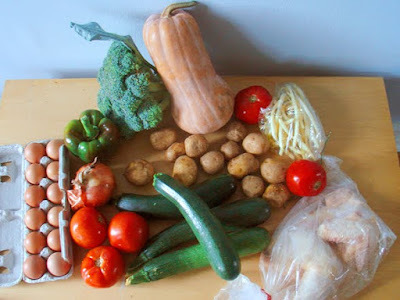 The vegetables this week were still abundant, and delightful. The yellow wax beans were the most juicy and tender I've seen all year. Can't wait to crack into that squash. I should note that I traded cauliflower for extra zucchini with a fellow CSA member. The swap box was empty, which leads me to wonder if the volunteers weren't aware they should put food in it so that members have something to swap. I forgot to pick up the eggplant. If my head weren't connected to my body I'd probably forget that too. Grocery store plums are not always too good. Yellow and firm, sometime sour meaning very unripe. Be it chance or a better crop, the plums at my local green stand are beautifully red, sweet with a balance of tangy and floral notes. I can't stop consuming them, so I decided to preserve a bunch for later. 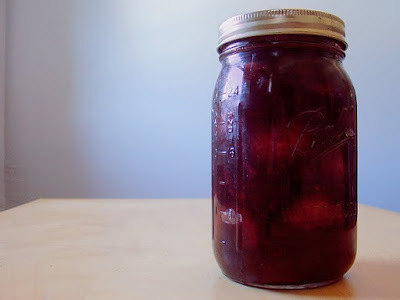 Little did I realize that these already outstanding plums could be made better. A splash and pinch of assorted spice, balsamic, a portion of a hot pepper and sugar brings out the savory nature of the plums making them a perfect pairing for serious proteins. Think braised pork, bbq tofu, or short ribs all slathered with the softened spicy plums. The weather is cooling off, and its been raining more than once a month. 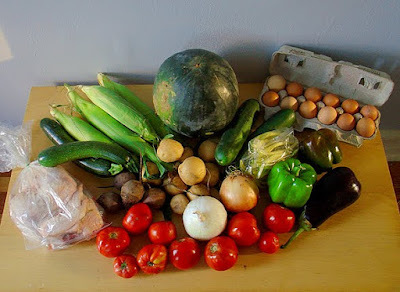 Its no surprise that this week's share of the CSA is end of the season huge and plentiful. Its time to have an end of season dinner party to use some of these beauties up before they turn. Early Saturday morning I cleared out my humble 36" by 30" nugget of garden with my plot partner to prepare for cool weather crops. Because of square foot gardening and the neighborhood greenthumb I've taken home a remarkable amount of food. Not quite enough to feed myself every day, but more than I need on top of my CSA. I took home an armful of what was left in the ground about 1/2 lb beans, a few hot cherry peppers, some stalks of potent basil, and celery greens. Rather than chop it raw for a salad or cook my harvest, I decided to pickle everything together to savor the garden freshens. What grows together, goes together and makes for an outrageous crisp raw pickle. 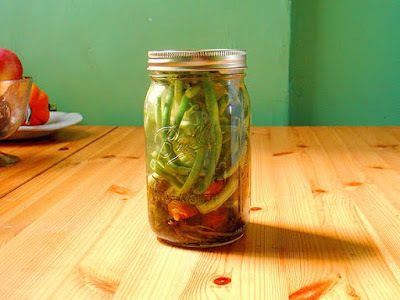 I plan to use my pickled beans in bloody marys, but they would be nice as finger food along with cured meats or cheese plate. Also try chopping the beans and serving them on top of salads. Hey Ditmas Park, save your strength for Monday night. I'm bringing my monthly party to Sycamore Bar and Flower Shop. 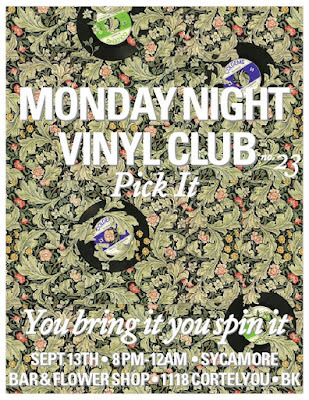 Bring you own vinyl, and spin a short set. Serious to strange encouraged. Vinyl Club has a pile of 45's for those less anlaog inclined. Will teach anyone how to dj in 30 seconds or less. F r e e ! 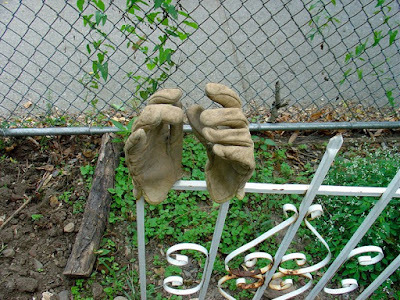 Feels like I'm losing count of what week of the Ditmas Park CSA share I'm photographing. I was slacking just before vacation (not really just meeting nutty deadlines elsewhere) and then 2 weeks were picked up by others. Here we are at week 11, maybe. Aren't those some red tomatoes? Solid and juicy inside like a proper tomato should be. I was happy to get beets this week. Beets I've missed you. I plan to stew this chicken, or make dr pepper chicken. 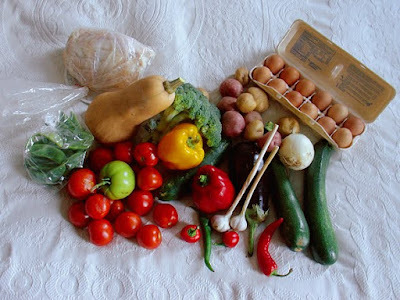 This just in read this excellent interview with my CSA farmer Jorge of Amantai Farm. Pictures of living chickens and fields before they hit the streets and kitchens of Brooklyn!